Book the best excursions, tours and activities in Costa Cálida online on sunbonoo and enjoy unforgettable holidays. Instead of waiting to get there and running the risk of not having anything to do, make your life easier by arranging all the activities that you'll do on your trip before you even get there. You avoid the disappointment of getting to a place and trying to book at the last minute and finding out that everything has already been fully booked. It goes without saying that by going around things like this, you won't be tempted to over the budget that you had in mind for your holiday. What's more, instead of being under the pressure of someone to buy something that you don’t want, which can often be the case in the tour and excursion kiosks, you have the time you need to choose something that's just right for you. Find something for all the family or something romantic for you and your partner. At times it's tricky to find something to get someone as a gift, put an end to the drama and find something fun and exciting for your loved ones to do on sunbonoo. The Costa Cálida is in the South of Spain, in Murcia, which is about 250 kilometres from Aguillas to Pedro del Pinatar. The Costa Cálida is the hottest coastal region in Spain which means this is a sun worshippers heaven with an average of 320 days of sunshine a year. Catch the rays on the beach or take to the mountains to get away from the hustle and bustle of the touristy areas. Go bathing in a salt water lagoon around Mar Menor and take a short trip into paradise. Have fun on land and in the sea. See the sea from a bird's eye view as you go paragliding. Rent a Jet Ski and go zooming around the Mediterranean Sea with your buddies. Try out scuba-diving in Mar Menor and get acquainted with its marvellous marine life. 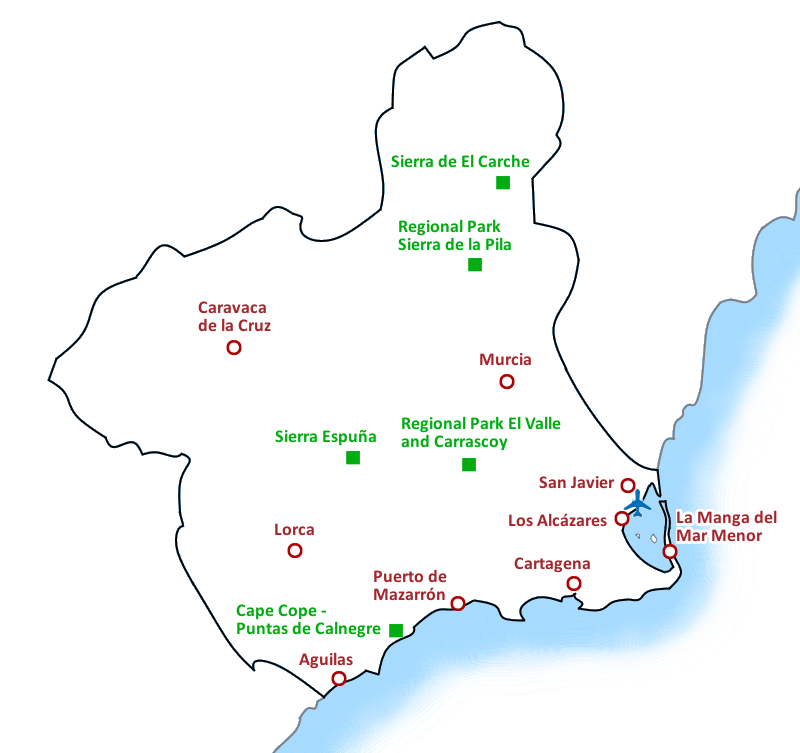 Mar Menor is the biggest salt-lake in Europe and borders four different nature parks. Go diving and get up close and personal with the fish and shipwrecks. Enjoy the Mediterranean Sea on a sailing trip on the Costa Cálida and explore the coastline from the seaside. Be a part of the action as you take in the atmosphere on a Sunset Sailing Excursion in Aguillas. Let the mix of colours drift you off to a Mediterranean dream. Two cities which need to make the cut on your must-see list are Murcia and Cartagena. Get to know Murcia, the capital of the province with the same name which has a deep history that you can find out all about on a city tour. Or go to Cartagena and discover architectural masterpieces from the Art Nouveau period and admire the 11th century fortress "Castillo de la Concepción" which stands tall above the harbour. The Costa Cálida has a lot to offer for holidaymakers who want to be active during their holidays. There is a first-rate 18-hole golf course in the south of Mar Menor. Or you can make friends with a horse and ride around the region on it. The beautiful wilderness in the Costa Cálida also welcomes you to take a walk through the countryside and breathe in the fresh air. Be brave and take part in a free fall with a tandem parachute jump on the Costa Cálida. Experience the feeling of freedom and marvel at the Costa Cálida from way up high. Satisfaction guaranteed! Adventurers can also enjoy the Jeep Safari Tours and Quad Tours. Get into the thick of the ruralness and drive off-road over the rugged untouched land as well as the more built-up land. Taking kids away on holiday can be a pain so give them something to keep them occupied and you're sure to have some peace and quiet. If you've got teenagers or even pre-teens, they'll lap up the fun on a banana boat or for the younger ones, let them see some of the sea life in Costa Cálida on a glass-bottom boat trip. If your kids love horses, you'll be happy to hear that horse-riding tours are available for them as well. Water parks and theme parks are guaranteed to put a smile on the kid's faces and will certainly get use up their energy. The sunbonoo team is looking forward to helping you out and getting you set for your holiday in Costa Cálida.